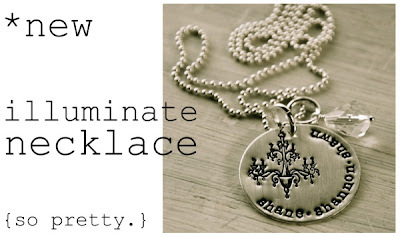 I’ve been a fan of Lisa Leonard’s jewelry for a quite a while, so I’m thrilled to give you the chance to win one of her new Illuminate necklaces. Don’t you love that swanky chandelier, and that sparkly little crystal? As always with Lisa’s designs, your necklace can be customized with any names, words or dates (anniversary anyone?) you choose. Just be sure to comment separately for each entry. I’ll announce the winner on Friday. yes please! I'm getting a little giddy seeing all these cool silver hand-stamped pieces everywhere! I love Lisa's jewelry! I have not seen this piece before and I love it! I'd get it for my daughter and have new grandbaby's name put on it! Thx for a chance to win! I'm a big fan too! It would be great to win this piece! LOVE it! I can just imagine my cuties names on it! I love Lisa's stuff; it's all beautiful. Lisa Leonard's designs are beautiful! would LOVE even more to be the lucky winner! I love her pieces and would be thrill to get this, thank you! Love your blog! Awesome giveaway! I adore Lisa Leonard jewelry! I love Lisa's jewelry! I would love to add this to my collection. She is so talented! Thanks for the chance to win! I commented on my facebook wall. Thanks again. I'm a huge fan of Lisa's jewelry! Good luck to me!! I LOVE chandeliers!! I need this necklace! Love the necklace.. so simple in design but absolutely glamourous!Thanks for the opportunity. such an adorable neckleace!! count me in please!! Beautiful jewelry would love to have some. A girl can't have too much jewelry, right? I love your blog! Thanks for this chance! Love that necklace...and the reminder to 'sparkle'! I posted your giveaway on Twitter! Enter me please! Beautiful jewelry! And I love your blog too. I love the handstamped necklaces! I love her work!!! I hope hope hope I win!!!! Oh, YAY! I love your blog and I love Lisa's jewelry! Oh I just adore Lisa Leonard! I'm a big fan of Lisa Leonard! I LOVE Lisa Leonard! Thanks! I love Lisa Leonard jewelry and would love to have a piece. An anniversary date is a great idea. Thanks for the giveaway. I love this necklace!!! I love that you can personalize it. I have a different spelling name (Meghann) and can NEVER find anything with that spelling. I am sooo praying that I win!!! I may even have my beautiful little girls name on it! I love her jewelry. I have 2 of her necklaces. LOVE LOVE LOVE this necklace! It's so pretty! I love her stuff and have my fingers crossed for a win! Love the necklace! Though I would love to keep it for myself, I would probably have to use it in my Race for the Cure fundraiser! What a great giveaway! Who doesn't love LL? Ooh! I have been eyeing these for a while now! Would love to be the lucky winner!! I love Lisa's jewelry! I haven't seen that chandelier pendant before...stunning! I love the from up here necklace and the new illuminate necklace, so cute! I love all of her stuff, but especially the illuminate necklace. What a great giveaway! I LOVE LISA. My sister gave all her bridesmaids a necklace and it is my favorite ever. I'd love to give one back to her! That is gorgeous. I hopw to win. Me! Me! I love her things!! I love Lisa Leonard jewelry! -- how gorgeous! Lisa has simply beautiful work! I shared this on Facebook!!! I have a new baby and would love this! I hope I win! Her jewelry is gorgeous. I'm in love with stamped jewelry, really loving the new ones' she has out. Keeping fingers crossed and hoping for a piece of jewelry to be sent my way, want something SO badly that has my children's names on it!!!!!! I love this necklace. I would love to win! love it and i know just the cutest two little boys names i'd put on it :0) thanks! Oooo - I wanna win! I love her jewelry - beautiful. Okay, just posted about it on my blog! Love love love lisa Leonard! I wanna learn how to do these so bad! I love her jewelry and this piece is beautiful!! wow! great giveaway, i love lisa leonard jewelry! thx! Oh, I have drooled long enough! These are sooo pretty! I LOVE Lisa Leonard's designs! I would love to win this beautiful necklace! I facebooked about your giveaway. beautiful jewelry :) hope i can win!! Oooohhhh- I love her stuff. It's so dainty and sweet! I hope I win! Love her new sparkle necklace! Oh goody goody goody! I LOVE this! I'm all over it! Tweeting now.. I'm all over it! Tweeting now! I love it! Wouldn't it look beautiful with "Let Your Light So Shine" on it? I hope I win! They are beautiful! Beautiful! Would love to win one of Lisa's necklaces. Gorgeous necklace. Thanks for the chance. Will post a link to my blog too! Oh! Oh! Oh! Me! Me! Me!! Please! I hope I win! This is absolutely beautiful!! OK! Just Facebooked about it!!! Just posted a link to your giveaway on my blog! That necklace is absolutely adorable! I just hinted at my husband that it'd be a good Valentine's gift! I've always wanted one of her pieces! Thanks for the chance! Me oh me! Please! My email is pameladana at gmail dot com. I love Lisa Leonard jewelery. I am asking for this for Valentine's Day. I mentioned this giveaway on facebook. Also excited about finding your blog. I mentioned this giveaway on twitter, but I just realized in a previous comment that I mispelled jewelry. Mommy Brain strikes again. I love Lisa Leonard's jewellery - the chandelier has to be my favourite yet! Love Lisa's line of jewelry!! I'm a devoted follower of your blog. Love the giveaway as well. I love Lisa Leonard Jewelry! Great Giveaway! Oh, I love her designs!!! OOOH, I DO LOVE the chandy necklace! Just found your blog and was drawn by the title alone! Off to explore! I love the Lisa Leonard jewelery! I hope I win!!! What a beautiful necklace! Thanks for offering us a chance to win it! So cute! I'd love to have one of those! Beautiful! I'd love to win! Me! Me! Me! Pick me! I love this necklace. My blog is private, but you can email me at jillus11@hotmail.com if I win!! LOVE Lisa Leonard! She has such lovely jewelry. Oh how I love Lisa Leonard! So cute! I've never seen her designs until, so awesome. Thanks for sharing! I will win a giveway one day. I will win a giveaway one day. Lovely! I ordered 3 of her necklaces for family members' Christmas gifts. They were a major hit! Love this new design. Fingers crossed. How sweet is that??? Would love to win! I would LOVE to win...I LOVE Lisa Leonard jewelry! it is so pretty! i would love to win one! That is my favorite necklace! So cute! Love this necklace, would love to win! It's on my facebook! Tweeted about it! I love her jewelry and have bought several pieces for friends but don't own any for myself...here's my chance...I hope!! I loooove this! Nice giveaway. Hope I win! So so cute. I can almost picture it around my neck white a simple white tshirt and a pair of jeans!!! I love it!!! Hope it's me!! This is my first entry EVER in a blog giveway!!! Thanks for letting me play. am i too late?? i want, i want!! have been drooling over her designs!! Pretty I'd love a chance to win. what a great necklace! her stuff is divine! what a cute necklace,i would love to win one! i commented with a link to your blog on facebook. This would be so wonderful to be able to wear everyday! LOVE it, it's perfect. Please enter me for this giveaway! Her work is SO stunning! yes please! i loooove these. they're just gorgeous. I love her jewelry! Great giveaway! Thanks! How beautiful! I'd love to win one of these. Thanks for the giveaway. Angelalittlegott(at)gmail(dot)com. Great giveaway. Love the jewelry. Lisa is so talented! Thanks for the great giveaway! When I saw your contest my jaw dropped and my eyes popped. I couldn't post it on facebook fast enough! Lisa Leonard's designs are awesome and I have dropped hints about someone giving me one of her necklaces one day. (Nobody seems to catch on around my house.) So - I would be sooo happy if I actually won! thx for the fun giveaway. Love that necklace!!! Thanks for the chance to win!!! Lisa Leonard's jewelry is so wonderful! I'd love to give this as a gift to a special new mom I know. Thanks for offering this give-away! I absolutely love this necklace! I've always wanted a hand stamped necklace. Thanks for the chance to win one! Lisa Leonard ROCKS! We purchased a necklace for my MIL for Christmas with all of the grandchildrens names on it. It literally TOOK MY BREATH AWAY when I opened it!